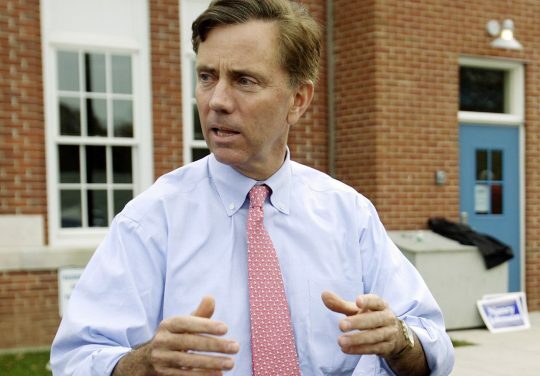 Ned Lamont is the Democratic candidate for governor of Connecticut, and his attempt to slip his first name into the state's name made for an unfortunate slogan. He placed the name "Ned" into Connecticut, creating a sign that said, "Vote conNEDticut." While it made sense phonetically, spelling out "conNED" was likely not his intent. Washington Post reporter Dave Weigel flagged the slogan, screen-shotting a picture of Lamont during a local TV interview and writing, "Folks can we talk about this slogan." Lamont, a businessman and politician, previously made a run for the governorship and a U.S. Senate seat in Connecticut. He ran for Senate in 2006 and defeated Joe Lieberman in the Democratic primary. Lieberman, however, came back to win the general election as an independent. Lamont went on to run for governor in 2008 but lost at the state Democratic convention and ultimately in the Democratic primary to Dannel Mallory, the state's current governor. Lamont faces Republican Bob Stefanowski in the general election. Malloy decided last year not to seek reelection. This entry was posted in Politics and tagged Connecticut, Governor. Bookmark the permalink.